This process covers the development and criteria for establishing profiles for BGA removal and replacement. Recommended for technicians with soldering and component rework skills and exposure to most repair/rework procedures, but lacking extensive experience. High temperature polyimide tape discs, .50" diameter. Figure 1: Flux manufacturers reflow profile. Figure 2: Precision drill press. Figure 4: Ideal thermocouple placement. Figure 5: Temperature data using analysis software. A thorough review of the equipment manual and comprehensive training are mandatory. Daily maintenance is essential. Consult the equipment manual for more information. This method may subject the component to extreme temperatures. Evaluate the component's tolerance to heat prior to using this method. Plastic BGA's are especially sensitive to moisture absorption. Carefully evaluate pre bake requirements. 2. Copper delamination, separation of pads, barrels of inner layers. 3. Burns and solder mask chipping. Each circuit board must be treated individually and scrutinized carefully for its reaction to heat. If a series of circuit boards are to be reworked, the first several should be handled with extreme care until a reliable procedure is established. One fully assembled development board is required. 4 to 6 sample BGA components for development may be required. A steady state operating temperature or threshold must be established prior to launching the reflow cycle. A consistent temperature starting point is necessary for repeatable results. Between 110 C and 140 C is recommended. The BGA replacement profile may require more time and even more heat (usually not more than 20 seconds time) to not only reflow all joints but to properly evacuate flux gases and create uniform joints across the package. Insert thermocouples into the holes. Ideally the thermocouple is secured in place by the solder of the pad that the thermocouple is placed in. (See Figure 4) Otherwise secure in place with high temperature tape, and thermal adhesive. Additional thermocouples will also be placed on the top of the circuit board, about two inches from the site and on the bottom side under the site. These thermocouples may be merely taped in place. Select an appropriate nozzle and install. Be mindful of the component height and clearance area around the component. Secure the board in place with appropriate tooling, clamps, and pins. The board should be secure but allowed to move with thermal expansion. Antistatic solder wave fixtures may be used to prevent warp. Connect the thermocouples (drilled locations) to a temperature recorder. Connect other monitoring thermocouples to hand held digital thermometers as required. Temperature recorder should present graphic display as per Figure 5. Select soldering process parameters from similar existing profiles. If none are available, contact the manufacturer of the rework station. It may be advisable to shut off all vacuum commands when developing a removal profile to prevent inadvertent component removal. Pre bake the board to drive out accumulated moisture. The length of pre bake will be affected by the board's environmental exposure. A pre bake temperature of 75 C to 100 C is recommended. Place a pre baked board onto the fixture. Establish a bottom side, under part threshold temperature from which to begin the reflow ramp. 140 C underneath the part should correspond to approximately 90 C at 2" from the nozzle on the board's top side. Choosing a starting point in this approximate temperature range will help to reduce localized warping during BGA ball reflow. Run the process and monitor the temperature of the bottom and top of the board, next to and under the component. Disconnect the thermocouples and download recorded data. 1. Maximum temperature at the solder ball / board pad interface should be 205 C.
2. Minimize temperature differential to less than 15 C for internal thermocouples measuring the various solder ball / board pad interface. 3. Time above 183 C should be between 30 and 60 seconds. 4. Temperature rise and fall should not exceed 3 C/ Sec ramp. Make changes to process settings as applicable. Run the process and return to step 13. Examine the surface under the component for warp. Excessive localized warp may be reduced by increasing the pre ramp temperature threshold. A convection oven can be used to decrease the thermally induced stress caused by the process. Even heating across the whole board may be required. The component will typically release from its pads when two of the thermocouples measuring joint locations pass the 183 C mark. In order to reduce mask, part or board damage due to excessive heat, the removal cycle is typically shorter than the replacement cycle. Reflow the joints just enough to effect removal. Copy the parameters of the soldering profile to develop the removal profile. Change process parameters as needed. Connect the thermocouples (drilled locations) to the temperature recorder. Connect monitoring thermocouples to the hand held digital thermometers. Run the process and monitor externally connected thermocouples. 1. Maximum temperature at any location should be 210 C.
2. Minimize temperature differential to less than 15 C for internal thermocouples. 3. Time above 183 C should be between 30 - 60 seconds. Adjust process parameters as needed. Determine the time in the process when all ball locations reach 183 C. Note the bottom side monitoring thermocouple temperature. Inject flux under the component. Run process and lift nozzle three seconds after reflow has been reached. Remove the component using vacuum tool. If software controls the vacuum, select the vacuum on command for all events. This will lift the component as soon as reflow temperatures have been reached. If the component can not be removed, analyze the temperature data and adjust the parameters. Return to step 10. 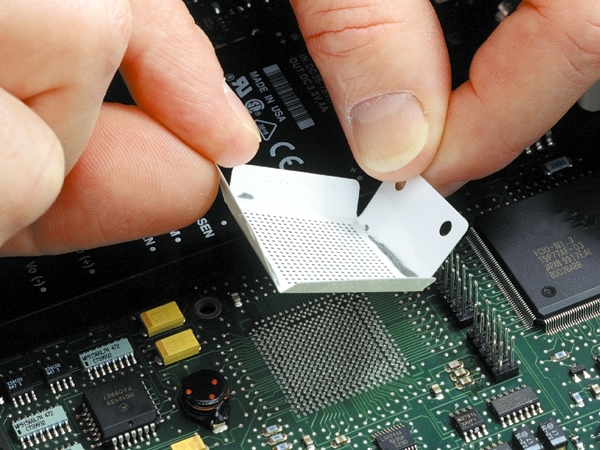 Inspect the BGA footprint area for signs of unexpected overheating, solder mask or pad damage. Flexible anti-static polymer film solder paste stencils with a residue-free adhesive backing.